It is said that this is a portrait of Mary, the Mother of God herself, painted by Saint Luke on a wooden table that Jesus built. It has hung in this church for more than 600 years. 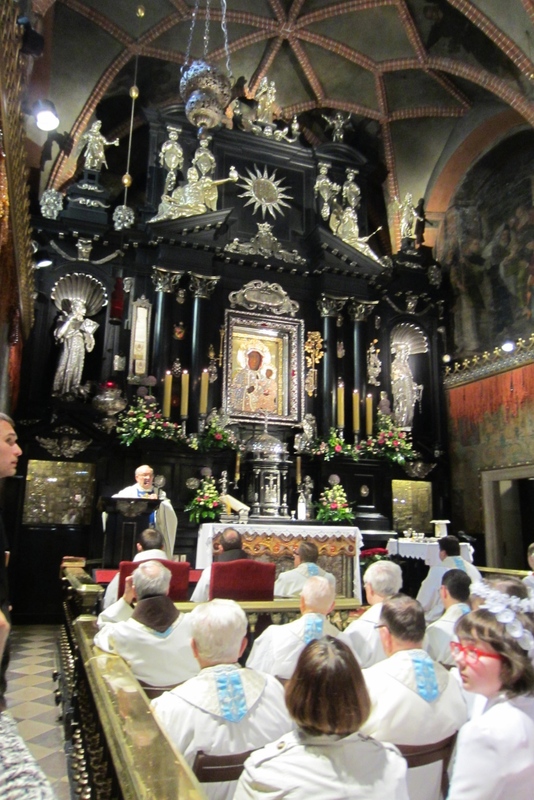 August 26 is the feast day of Our Lady of Częstochowa, the Black Madonna of Poland. 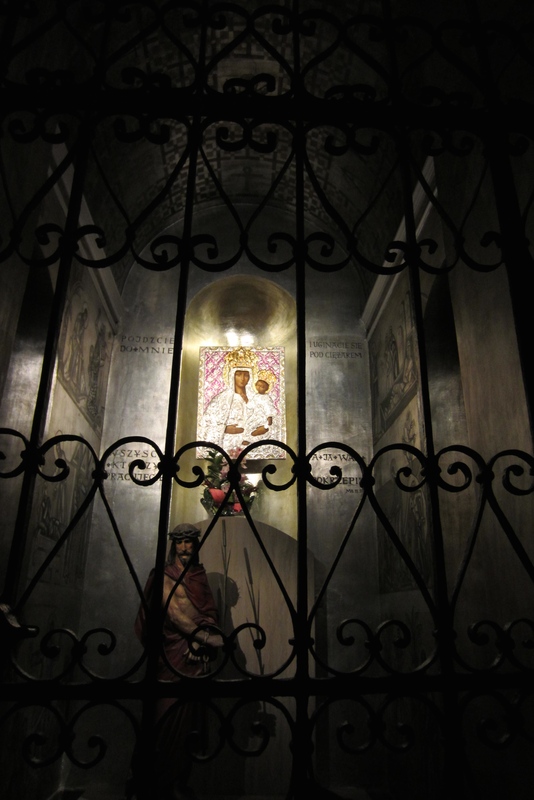 For more than 600 years, her tranquil face, scarred by assaults by arrow and sword, has looked out over a pilgrim-filled church built in her honor, on a hill called Jasna Gora, not far from Krakow. She has been through battles and wars, handed off from emperors to kings and hidden away in catacombs. People have prayed for her help, walked on their knees in pilgrimage to see her, and left their crutches behind after being cured of their ailments. 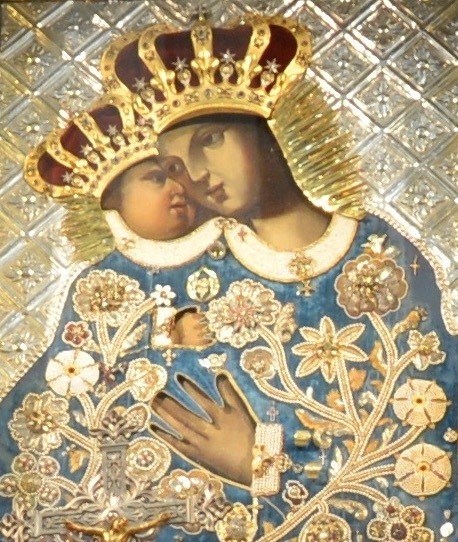 Hundreds of miracles have been credited to this miraculous image and Our Lady of Częstochowa’s intercession over centuries. 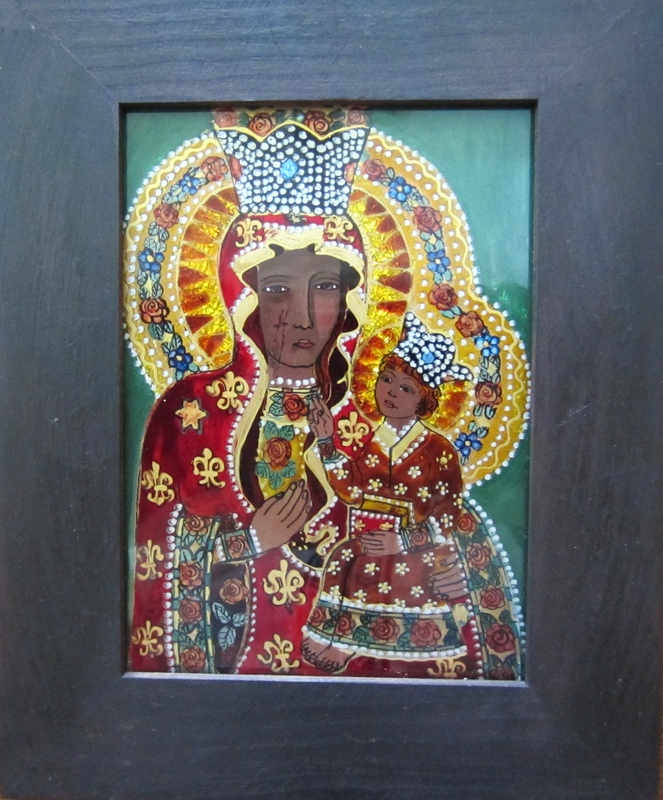 A contemporary rendition of Our Lady of Częstochowa by artist Janina Oleksy-Lew. For Poles, she is everything. She was officially proclaimed Queen of Poland in 1656 by King Jan Kazierz, who consecrated the country to the protection of the Mother of God. She has since been revered as protectrice and a symbol of Polish nationalism and religious liberty. 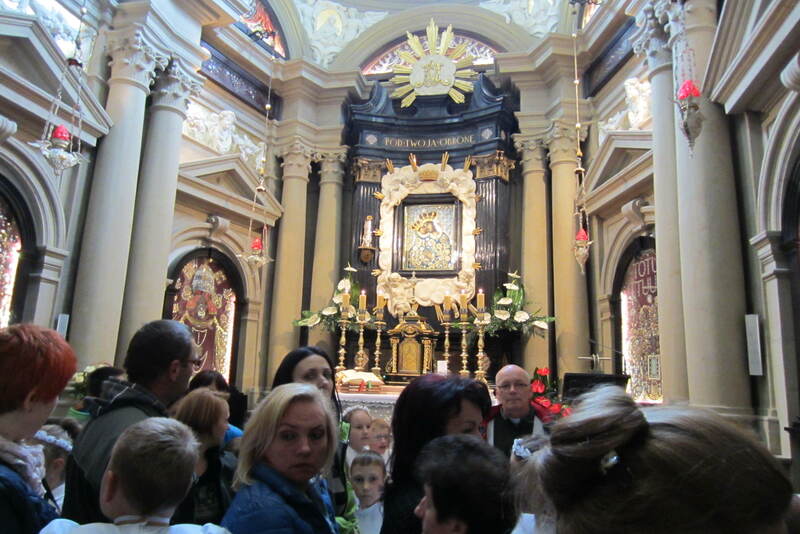 Most parishes in Poland have shrines dedicated to her. 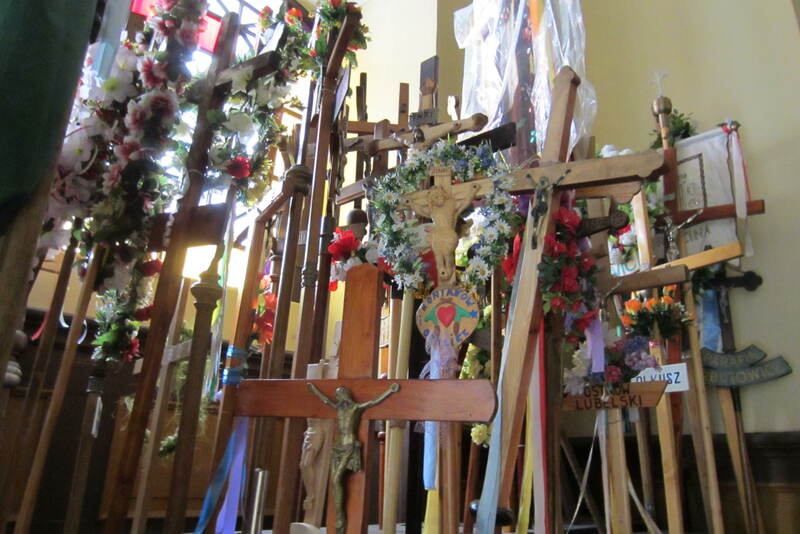 There is a shrine to Our Lady of Częstochowa in just about every church in Poland. But the story of this miraculous image begins long before that. It is said that this is a portrait of Mary, the Mother of God herself. It was painted by Saint Luke on a wooden table that Jesus built when he was apprenticing to be a carpenter with Joseph. This is just the very beginning of the 19” x 14” miraculous portrait’s life. Some say it was hidden away for years after it was painted to survive the siege of Jerusalem, around AD 70. Then, in 326, Helen, the mother of Roman Emperor Constantine the Great, traveled to Jerusalem to find the relic. She brought it back to Constantinople for her son, who built a church near his palace for it. Stories are told of residents carrying the painting through the streets of Constantinople to successfully repel an attack by the Saracens. 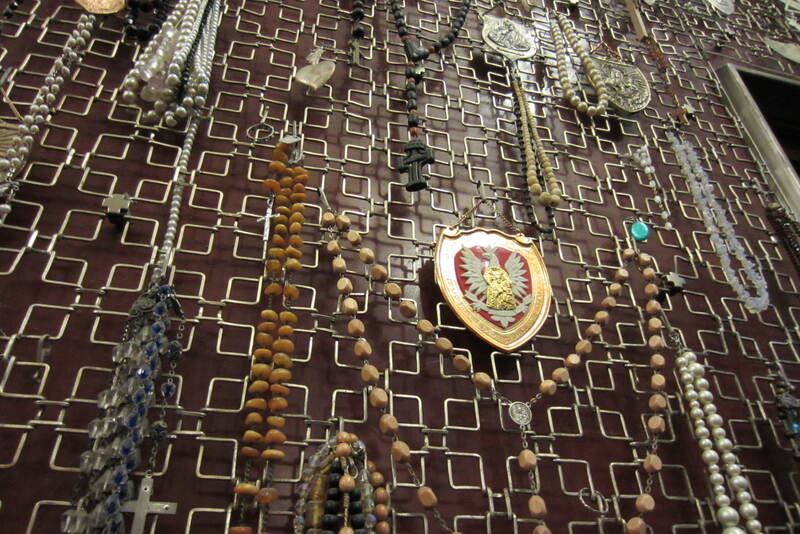 The walls of the church at Jasna Gora are lined with rosaries, jewelry, medals, and mementos of prayers granted. Later, Emperor Izauryn ordered many holy objects to be burned in the empire. His very own wife, Irene, hid the painting in the palace and began a tradition of passing the painting down from empress to empress in the court of Constantine. Through intermarriage of Russian royalty with those of Constantinople and later with Polish royalty, the painting found its way to the Belzki Castle, where it remained for 500 years. During attack by Tartars on Prince Ladislaus’s fortress in 1392, an arrow soared through the chapel window and struck the painting in the throat. Prince Ladislaus wanted to keep the painting safe from repeated invasions. He stopped in Częstochowa on his way to his hometown, and the horses could not move the carriage from its place. Twice, he dreamed that the painting should remain on the spot, a hill called Jasna Gora, or Bright Hill. This happened on August 26, 1392, and brings us to where we are today. 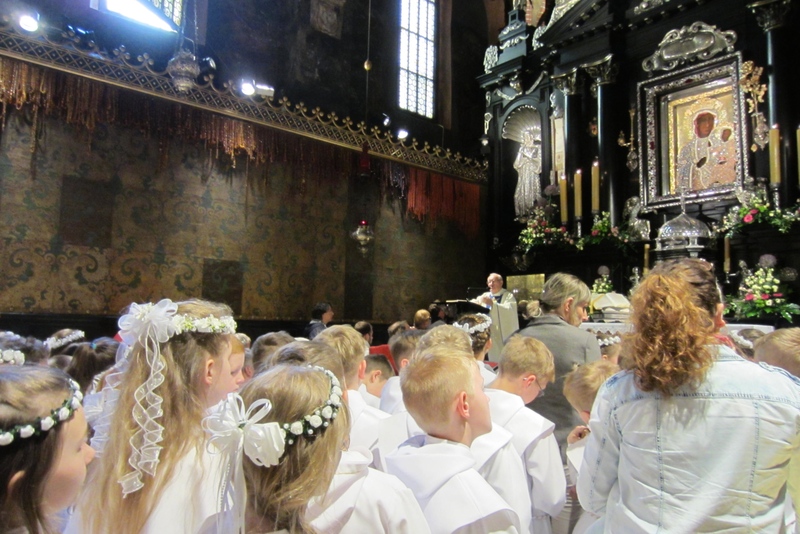 Children celebrating their first communion before the miraculous image of Our Lady of Częstochowa at Jasna Gora. 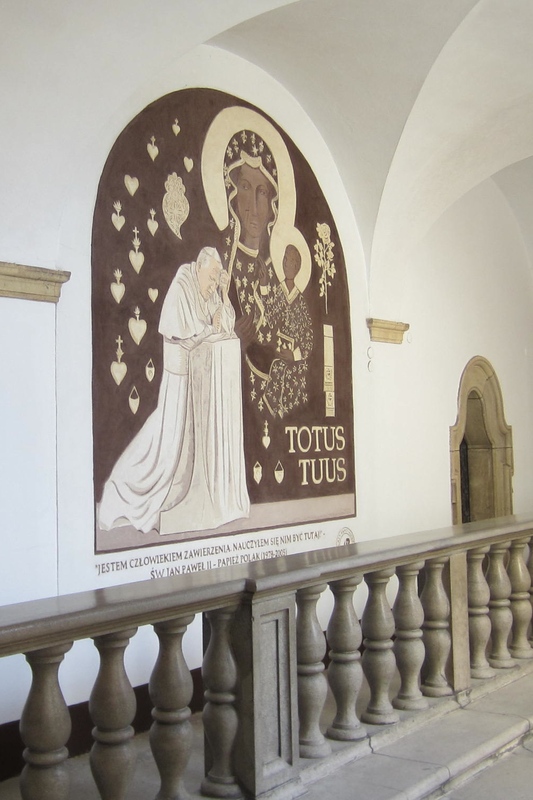 He built a chapel, a convent, and a cloister on the hill, entrusted the most pious monks to care for the painting. 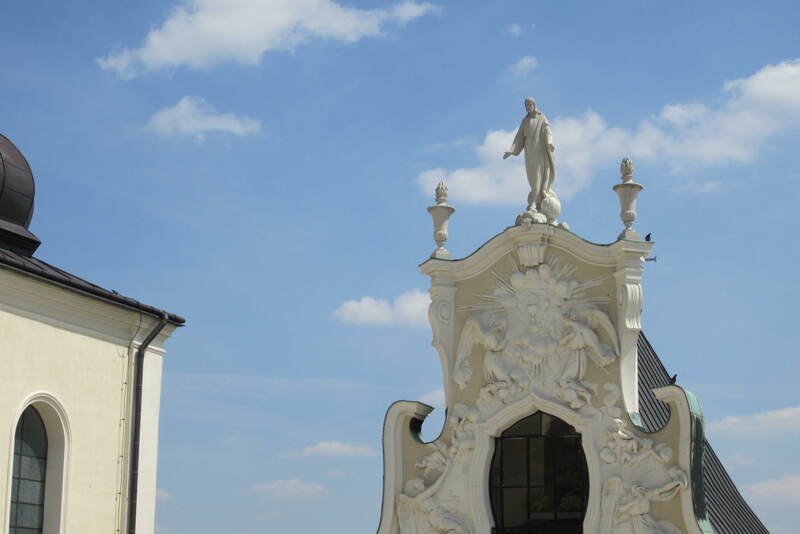 More than 600 years later, the feast day of Our Lady of Częstochowa is still celebrated at Jasna Gora. As are the many miracles credited to her intercession. Pope John Paul II held a very special devotion to the Virgin Mary. 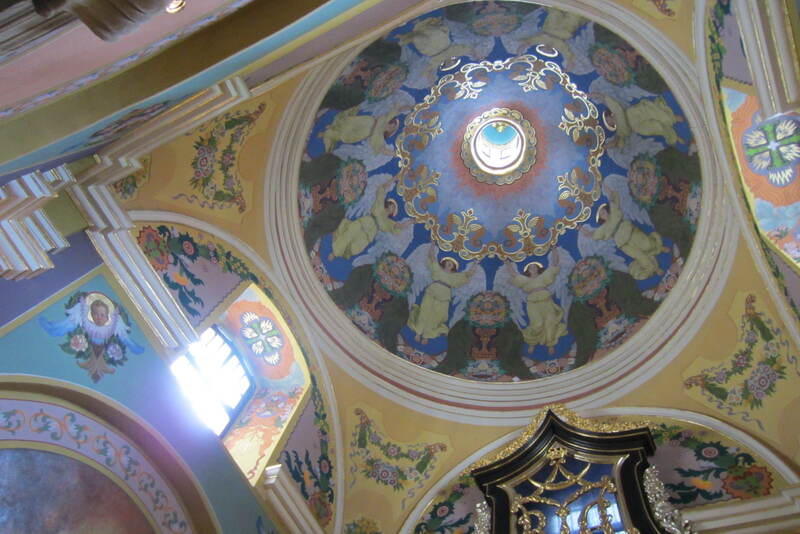 There is also a National Shrine of Our Lady of Czestochowa near Philadelphia, Pennsylvania. 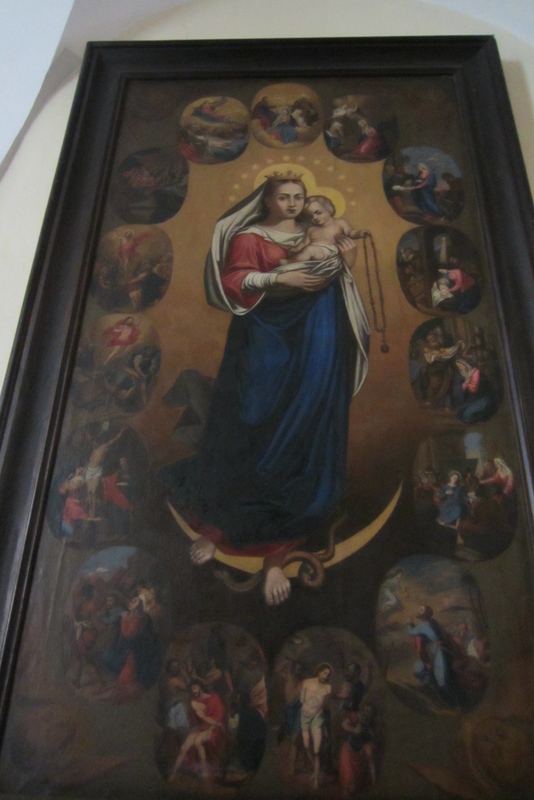 This is not exhaustive or entirely accurate history of the miraculous image at Jasna Gora as many sources seem to copy and/or contradict each other. However, this post meant to give a sense of the journey and impact of this relic and what it means to the people of Poland. My primary source is a book of miracles attributed to Our Lady’s intercession called “The Glories of Czestochowa and Jasna Gora” by Marian Press, along with stories on the websites Roman Catholic Saints, Holy Spirit Interactive, and others.